This isn't a recipe, nor is it instructions to anyone other than me, it's just a statement of where I am right now in terms of baking bread. Some will be appalled, others might be inspired. Most probably won't care! Right now, I'm keeping it simple. When we moved from San Francisco, CA, to Norfolk, VA, we found that there really wasn't the kind of bread here that we were used to. At that point, I sort of fell in to teaching myself to make european style breads, of the kind that we used to buy from Acme and Semifreddi. Since my wife and I have always cooked and cooked fairly well, we had a pretty well-equipped kitchen (including large, heavy mixing bowls, and some strong wooden spoons, a pizza stone+peel kit someone gave us once, and so on). I haven't bought any new equipment for bread baking, and that's the way I like it. I mix and knead by hand, I score with a very sharp german-made paring knife, I bake on a pizza stone. Since I've developed a little skill and some small understanding of how breads work, I've stopped measuring much of anything for breads I make frequently. I use measuring cups to scoop flour and carry water around so I know roughly where I am at, but mostly I follow my nose around familiar recipes. My goal is to understand the way the dough should feel, and to adjust it as I go. Sometimes I am trying to make it feel the same way it did last time, other times I'm playing a little 'what if it's a little wetter? I wonder what the result will be' game. Consistency, as you will have guessed by now, is not something that matters to me. I have enough understanding to know that the result will probably be good, whatever it is. If it's a slightly different loaf from last time, well, perhaps I will learn something about how changes in handling change the loaf, and as a bonus, my family gets a new bread to enjoy! dough temperature (I'm not completely fussy, but I do try to cool things down when the ambient temperature is too high, and heat things up when.. well, this is Virginia, it's not really too cold very much of the time). salt, which I worry about to the extent of having a base idea of where it should be, and adjusting up or down a bit if I've got a bit more or less dough than the basic recipe. Note that even here I'm not measuring, I'm following my nose, just to push things in the right direction. Nothing is too extreme here, so even these rough adjustments get the temperature within a couple degrees of right, and the salt within a gram or two of optimal. And, hey, every error yields a "new" kind of bread! Anyways. This is really just a note to a future me, and maybe someone else will find something herein they can use! 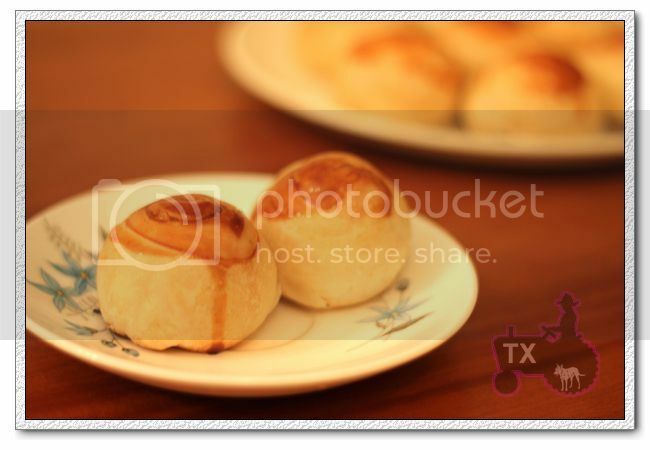 Chinese mooncakes - Happy Mid Autumn Festival ! 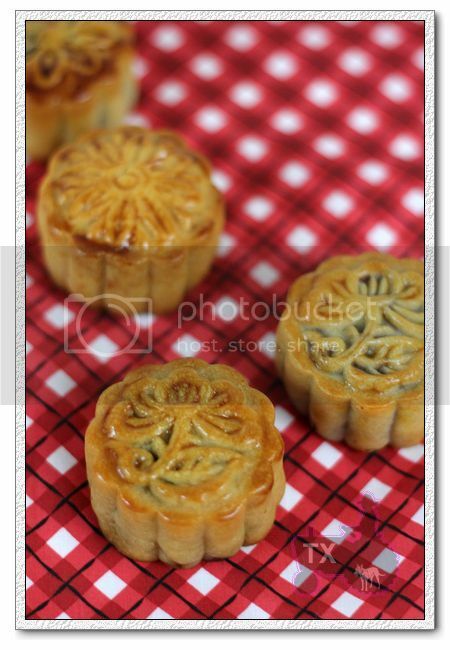 This year Chinese Mid Autumn Festival falls on 9/22, Wed, even though it still feels like high summer here in Dallas, I have been making traditional mooncakes to mark the occasion. Traditionally, it''s a holiday for people to gather with loved ones. The round moon symbolizes "togetherness" and "family". My parents are in Seattle, while my husband's family is all the way in China, so we can only celebrate with them spiritually. 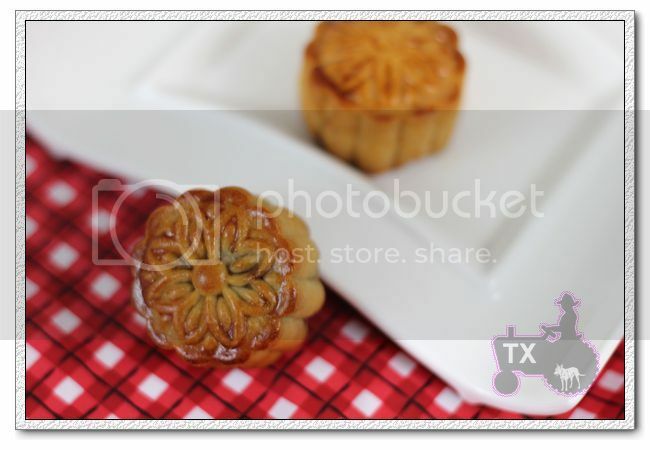 These mooncakes in the picture are of "Cantonese" style: the dough was kneaded then filled with various fillings (usually sweet), pressed with a special mold with different patterns for the top surface, then finally baked. 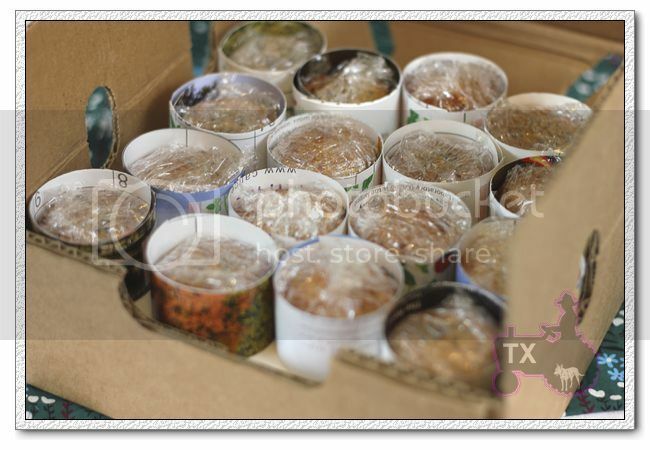 The process of making them was long and tiring since I had to do everything from the scratch, while in China one can often buy the fillings or other ingredients readily made. It took me a whole day to make 40+ of them, with 3 different fillings: red bean paste with salted egg yolk, chestnut paste with salted egg yolk, and finally coconut cream. The hard work was worthwhile though since we took them to my parents' home in Seattle last weekend, and had an early celebration there. My husband made very nice packaging for these so they don't get destroyed during the trip. 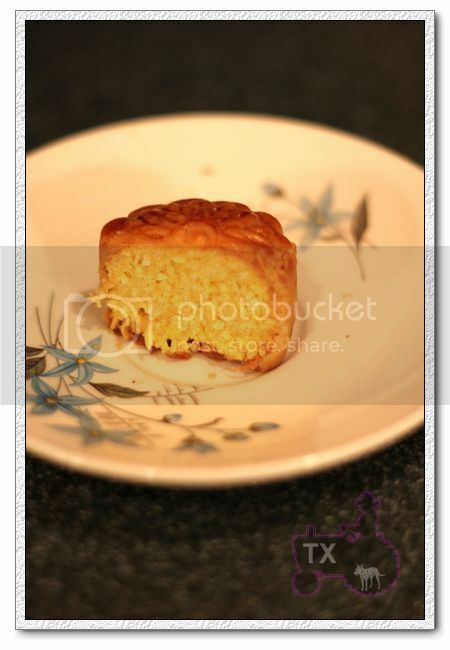 While in Seattle, I also made a batch of "Suzhou" style mooncakes. 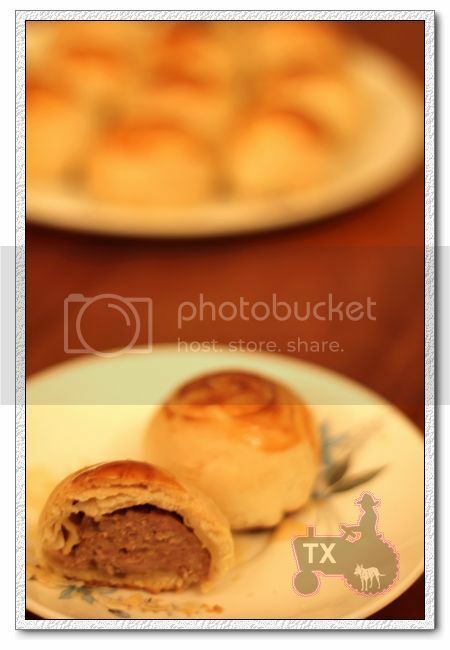 They have a different wrapper than the ones above, laminated similar to danish dough, and the filling is often savory. Here we used grounded pork and salted cabbage. 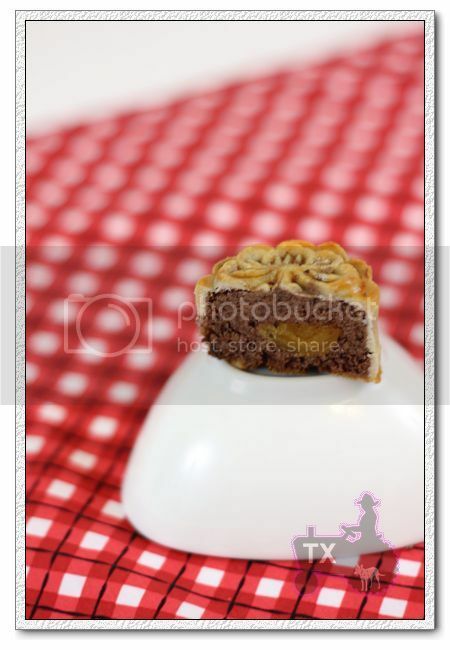 Read more about Chinese mooncakes - Happy Mid Autumn Festival ! 4:45pm - Place all ingredients in large mixing bowl in the following order: water, levain, flour, salt. Mix with large rubber spatula until a shaggy dough is formed. Mix with wet hands to ensure all lumps and dry bits are gone. 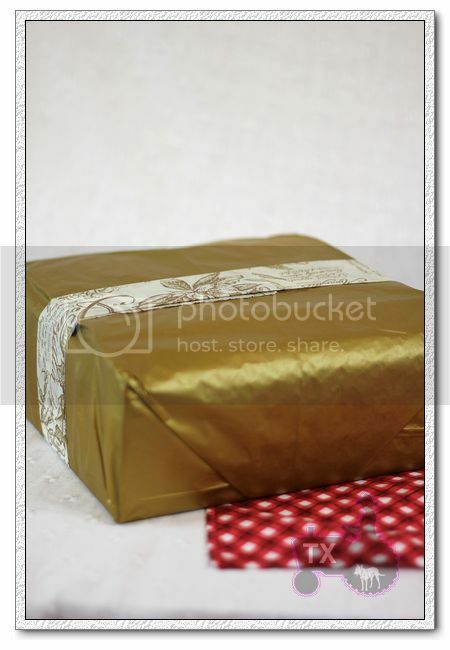 Place bowl in large plastic bag and let rest. 5:30pm - Turn dough, divide into 2 equal pieces (1500g), transfer to lightly oiled plastic tubs, cover, let rest. 5:45pm - Turn dough, cover let rest. 5:00am - Place 2 baking stones on 2 levels along with steam pan with lava rocks. Place a few cups of water in steam pan. 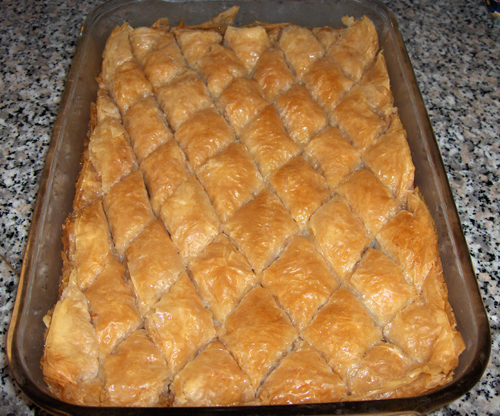 Preheat oven to 500F with convection. 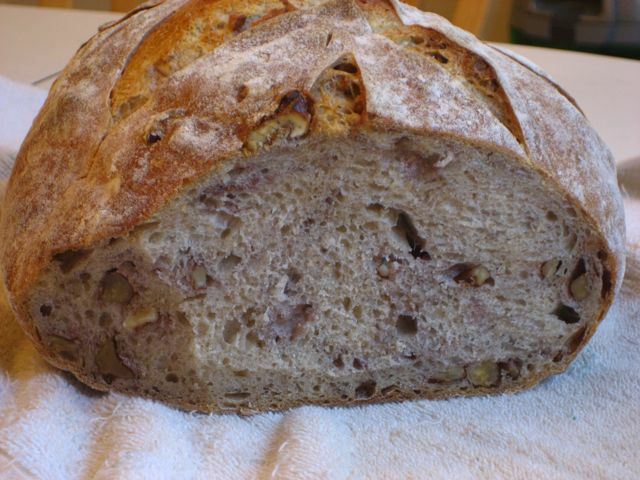 This is my imitation of Acme Bakery's walnut levain. 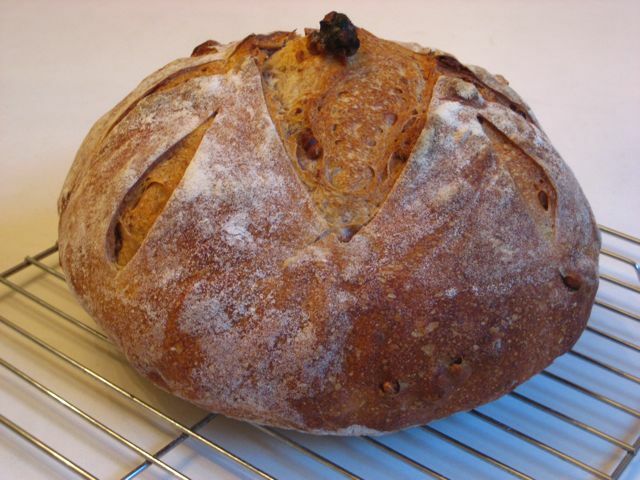 It's based on the Mixed Starter bread recipe in Baking With Julia. If you're not comfortable working with doughs by feel, if you really prefer to weigh ingredients, this recipe will not be helpful to you. Thaw the old dough, if necessary, and cut/break it up into the water. Let soak 5 minutes or so, then mix in the flour. Knead to mix thoroughly (no need to develop gluten here). You're looking for quite a firm dough here. Let rise overnight. Mix all together. Set out overnight (you will have two covered bowls sitting out overnight, the first starter, and this sourdough mixture). As before, let the previous dough soak in the water for a while, then add the flour and mix/knead. Again, you're looking for a moderately stiff dough. (feels like 50% hydration, perhaps?). Let this rise 4 hours or so. The sourdough mixture should be well-active by this time, approaching "mature" (not growing any more, starting to deflate a little), and the second starter should be well-risen (doubled, soft, ideally with some visible bubbles under the surface). When the second starter and the sourdough mixture are as described, which should be at least 4 hours, but could be more. place them both in the fridge for at least an hour, but longer is fine. 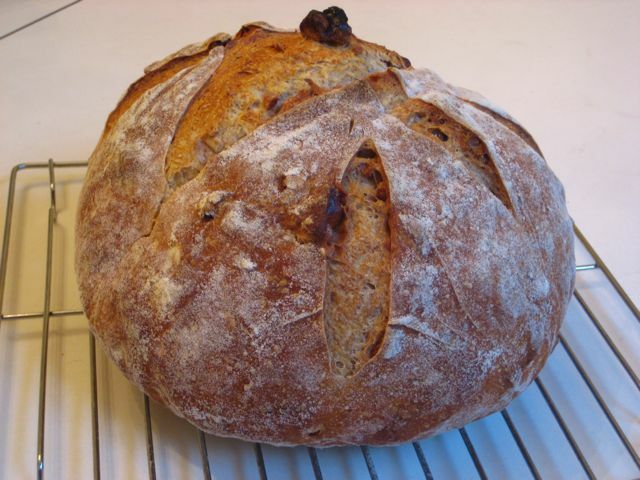 The sourdough mixture is used for flavor, not really leavening, so you don't need to be very fussy about how mature it is. Let things warm as appropriate to manage your final dough temperature (you're shooting for around 75F, of course), and begin adding sourdough mixture and flour to the water/yeast/starter mixture. Add the salt fairly early. When you have acheived a shaggy mass, begin to knead. You're looking for around a 65% hydration dough here, moist but not particularly hard to manage. Knead thoroughly, 8-10 minutes by hand. Now add 1 cup of coarsely chopped walnuts. Knead them in gently, enough to ensure they're evenly mixed in. bake at 425 or so, with steam, 45-50 minutes. Baking will take longer than you might guess due to the walnuts. The crust should be more brown than golden. Fall is the time of the year when Alsatians and wine loving Germans think: "Zwiebelkuchen"! For this mellow sweet onion pastry is the perfect companion to new wine. If you travel in fall through the wine growing areas left and right of the Rhine, you will find inns, restaurants and many vinyards offering sparkling new wine (Federweisser). 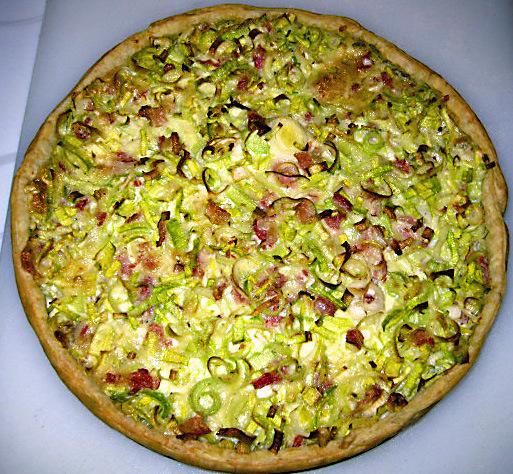 They often serve it together with freshly baked Zwiebelkuchen (Onion Tarte) or, an equally tasty variation, Porreekuchen (Leek Tarte). Okay, after all the compliments and enthusiasm over my new WFO, it is time to tell the dirty details of something I only just touched on in my earlier blog post: the little matter of too much fire too soon, and the problems with the doorway arch. The crack is not all that bad, but the brick problem is another story. A couple of days earlier we had noticed these bricks had come loose. When I investigated, the mortar and the bricks had all separated from each other and the mortar was just loose slabs between the bricks. This next shot makes it easier to see both the loose mortar and the keystone brick dropping through the top of the arch as well as a head-on view of the crack. I hoped the insulation layer would secure things together, but the heat expansion in the dome proved I was just wishful thinking. Something had gone wrong somewhere and my arch was coming apart as I stood there. You can see the tops of two bricks I wedged into the arch to hold things up while the oven cooled off and I figured out a plan. Here you can see my solution, if you look carefully. I hope we can get a better shot of this tomorrow when the light is better, and I will edit that shot in here if we are successful. However, if you can see it, my solution was to break another rule about ovens: I installed a metal arch support in the form of a hoop shaped to fit inside my arch. I made the hoop loose fitting, and then loosely packed a wood stove door gasket made of a fireproof, non-volatile glass fiber between the hoop and the brick to take up the slack and provide compressible space between the hoop and the masonry. These materials expand at different rates and to different extents, and I have no idea if this will work or not. Since my alternative if it fails is to rebuild the arch, and my alternative if I don't try this is to rebuild the arch, this is a free chance to get lucky. As you can see in this shot above, I pulled all the old loose mortar out of all the arch joints. That's all it took too: I just grabbed it bare-fingered and pulled each wedge out in one piece. While working on all this and running around I noticed something I now call "probable cause". Earlier, I blamed this whole incident on too much fire in a green oven, too soon. The next shot proves I could be wrong about that. It certainly was contributory, but I'm not sure it was the cause at all. I think I made a bigger strategic error earlier in the building process, in how I joined the arch and the dome. If you look carefully at this next shot, especially at the very top brick, you will see it is tilted up to the right. This brick was dead-level when I built the arch. 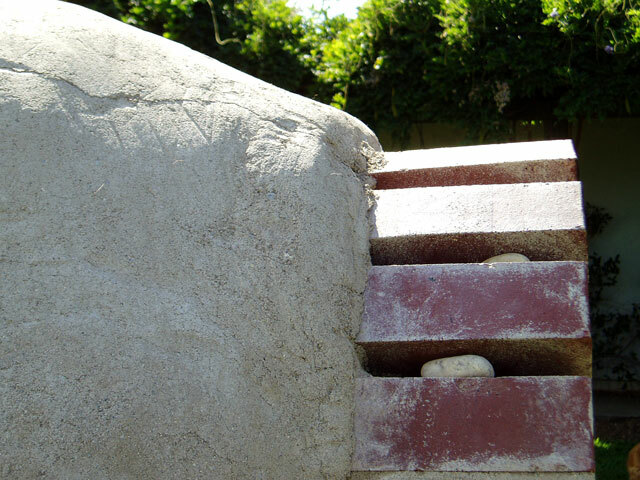 - When I mortared the arch originally I only mortared the front 75% or so of the wedge-shaped gaps. I left the rear 25% empty so I could tie in the oven dome itself. This was, I believe, the fatal flaw. - As planned, I built the dome and filled in the rear-most 25% of these mortar wedges in the same pass as building up the dome, effectively making those parts of the arch an integral part of the new dome. 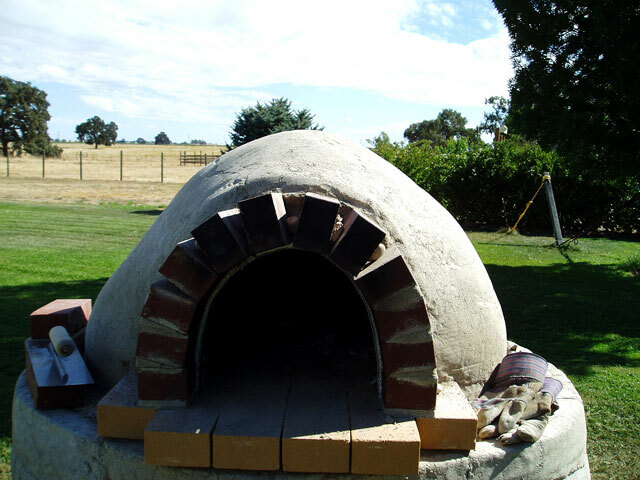 I also added a layer of oven mud over the top of the back 25% of the arch as well, thoroughly integrating the arch and the dome. 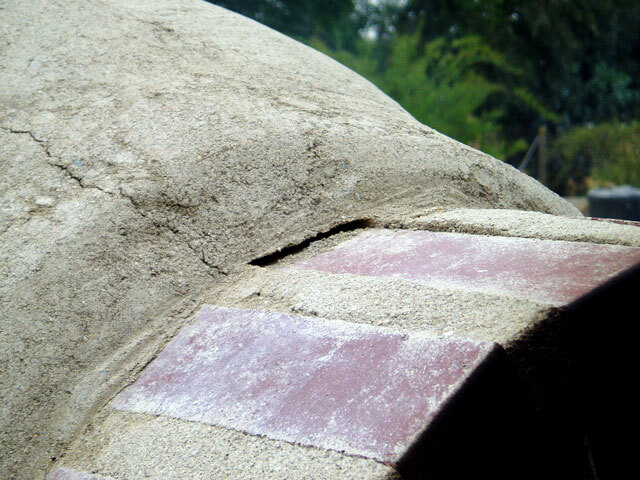 - I sat back and watched it all slow-cure as I kept the dome and the dome-arch joint draped with moist towels for three or four days, and then under cover of dry towels for two or three more days, all to slow down the surface drying and let the inner clay keep up better. During this time the new dome showed some stress cracks from drying, which I worked over with the back of a spoon as much as I could to try to iron them out. Honestly, it did not help much, and my overzealous drying fire on Saturday morning brought them all back. Now, look again at the tilt up-to-the-right of that top brick in the shot above. 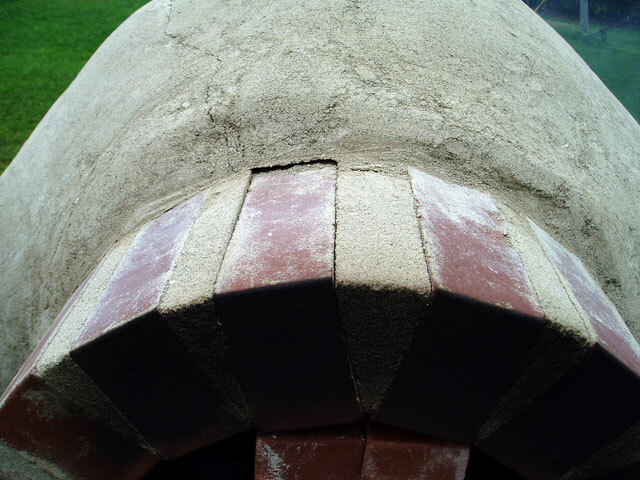 I believe the oven dome shrank significantly in drying, and because the doorway arch was so throughly integrated into the dome, the dome squeezed the arch in on the sides and down on the top at the back edges of the arch bricks, popping all the mortar loose and opening up bigger gaps between bricks than were there when I built the arch originally. When the arch alone was complete, the inner surface was continuous, with the inner edges of each brick neatly and firmly in contact with the edges of it's neighbors. Now it looks like carved jack-o-lantern teeth. The fact that I built too hot and too large a fire on Saturday only brought all this to the fore sooner. I now believe I doomed this arch when I tied it so tightly to the dome of the oven. Nothing I read told me I should do this, and it also did not tell me I should not. I learned that part myself. I installed the new metal arch support today, and also re-mortared the arch. Now I will give the fresh mortar in the arch a couple days to dry out and go back to small (yes, really small!) drying fires to slowly cure the oven dome and all, and see how it goes. When I am finally able to really heat things up I will find out if my metal arch is going to be a help or the final straw that destroys the doorway arch. Then I will know what the next chapter will be. Thanks for listening, and stop by again. I'll continue to post my progress, positive and negative, right here.